"These are challenging times, filled with big worries: wars and rumors of wars, possible epidemics of infectious diseases, droughts, floods, and global warming.... We are even challenged by the politics of conflict and the uncertainties sponsored by the aggressive new presidential administration in the world’s most powerful nation. "But as serious as all of this is, we must worry just as much about the rising tide of evil in the world around us. Though some of us may feel isolated from the physical and political threats I have just mentioned, all of us are surrounded with evil in literature, music, movies, videos—on the internet, in our schools, and in the marketplace. 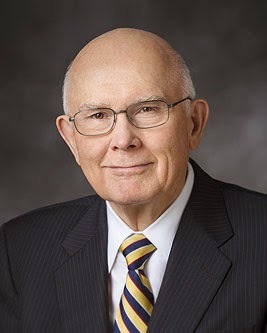 "I see all of these challenges as a fulfillment of Father Lehi's prophetic teaching that there must be 'an opposition in all things' (2 Nephi 2:11). We cannot change the evil influences that surround and press upon us and our families, but we can increase our power to deal with them as we push back against the world. We must try to carve out personal islands of purity and serenity and strengthen our barriers against the forces that besiege us in these protected spaces." This was a fascinating address by Elder Oaks. In speaking to college graduates, he addressed many contemporary issues and challenges as he encouraged them to "push back" against the negative aspects of the worldly influences that press on us from many sides. 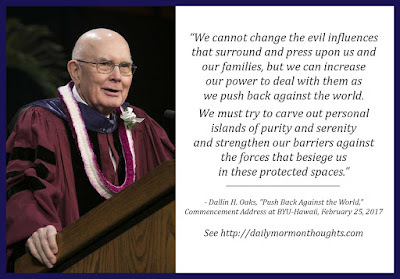 As we "push back against the world" and strive to push the world's evil and negativity away from our lives, we learn, as Elder Oaks encouraged, that the only way to resist is to create our own "personal islands of purity and serenity." And those islands only remain protected from the onslaught when there are strong barriers against the invading forces. 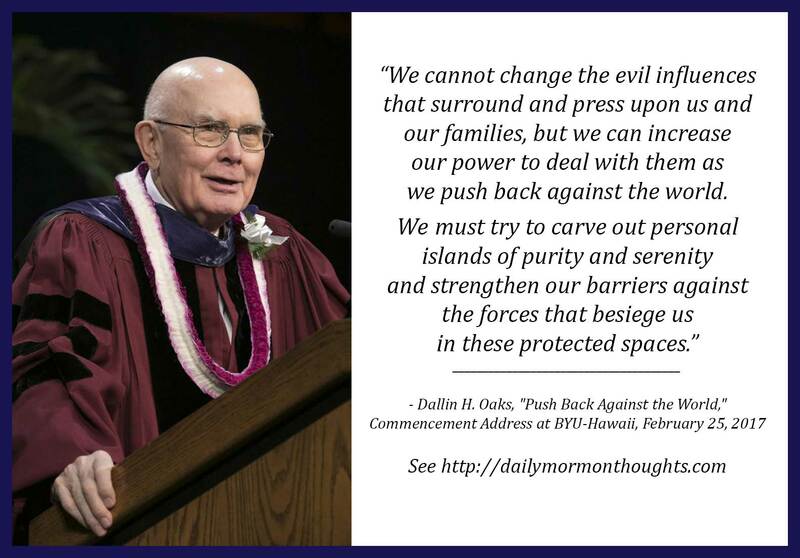 I love the imagery of Elder Oaks' suggestion. Do I have those islands in my life?